While browsing countless types of sunshades you came to the conclusion that a large umbrella would be perfect for you? Then you are in the right place! We are one of the biggest suppliers of very durable yet beautiful MAY umbrellas. They come in great variety of sizes, shapes, designs and colours. They are not only useful but also provide rich aesthetic and bring a pleasant atmosphere of relaxation. That is why they will perfectly prove themselves as shading for dining areas and bars as well as private gardens. Thanks to a variety of accessories available in our store you can easily customize your new umbrella to your needs and preferences. All of our umbrellas provide perfect UV protection and are created with great attention to detail so you can be sure that, regardless of weather conditions, they will meet your expectations. By simply adding a heater and lighting you will ensure your customers comfort even on cooler evenings. With the latest technology used when creating our umbrellas, we can be sure that they will retain their usability and aesthetic, even after many years of use. We hope that here you will be able to find solutions that are best for you. If you are looking for the ideal shading for large patio or your restaurants dining area we can certainly recommend you Schattello parasol. It is available in wide range of sizes even up to 2.5metres x 3.5metres. 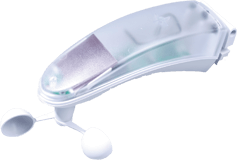 We can also provide you with many additional accessories that will increase its usability and your comfort. For larger patio areas or for commercial terraces, we provide a Centre pole range, which are available up to the huge sizes of 2.5metres x 3.5metres! Each Parasol in this range comes with a large range of additional equipment and accessories. For us, perfect workmanship is absolutely essential. Therefore, all moving axes of the umbrella are provided with bolts to protect the canopy fabric from damage. Such a solution ensures maximum stability and durability as well as easy execution of repairs. Our Umbrellas have a robust central rod system, which consists of discs with support struts and spokes. In order to prevent the spokes from getting twisted, the lower disc is firmly welded to the support pole. Thanks to the self-tensioning telescopic spring system the canopy remains perfectly taut, even after years of usage. The fabric can easily and quickly be exchanged by means of a practical hooking system. For Us, perfection is workmanship is an absolute must. Therefore, all moving axes on the Filius Parasols are fitted with bolts and the canopy fabric is protected from damage. This extravagant technology ensures maximum stability and durability as well as easy execution of repairs. Our Umbrellas have a robust central rod system, which consists of discs with support struts and spokes. In order to prevent the spokes from getting twisted, the lower die-cast disc is firmly welded to the support pole. Albatros is an exceptionally big umbrella and with its range up to 7 x 8 meter it is capable of shading even a very large area. It has been specially designed to meet the requirements of outdoor catering and large-scale solar protection of entertainment spaces. The distinguishing feature of the Albatros is maintenance-free drive and particularly robust construction that makes it remain reliable for many years. Optional LED lights and a heater can be added in order to provide you with a supreme aesthetic experience and creating a great place to relax even in the cool evenings. Simple yet elegant design of this umbrella will add a unique charm and exclusive atmosphere to any exterior area without a clear impact on the surrounding architecture. Thanks to our parasol your restaurant will gain inviting and warm feeling that your customers will certainly appreciate. 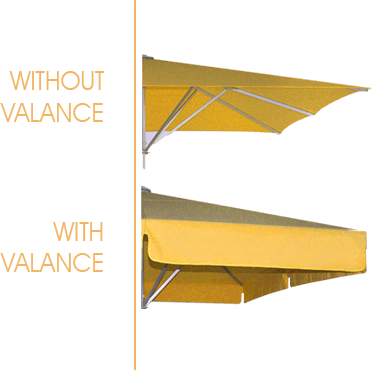 At Shades awnings and canopies we realize that even the most beautiful and durable shading will not fulfil its role without the appropriate base. Therefore, we have prepared for you a wide selection of umbrella stands made of high quality materials and in many different designs to make sure that everyone will find something for himself. Wide range of our movable stands will be an ideal solution for those who appreciate flexibility and convenience. Your shading will be always where you want it to be! If you are looking for a stable and practical solution for your umbrella, check out our wide range of stationary umbrella stands! We are sure that you will find something for yourself. 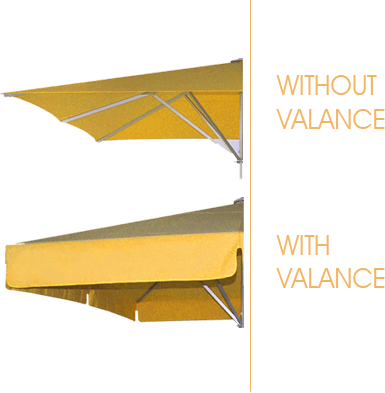 At Shades awnings & canopies we also offer a great selection of accessories such as side walls that will provide additional protection from wind and will easily transform your shade into a convenient tent. You can also improve your umbrella by adding useful wind sensors, heaters or remote control that will make it even more comfortable. Great comfort within your reach! 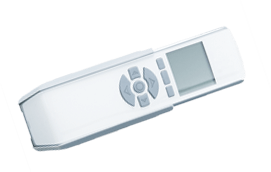 Thanks to the remote control you will be able to instantly open and close your new awning by pressing one button. It will save your precious time and make spreading your sunshade easy and effortless. If you want to use your umbrella in exposed locations then we highly recommend you our wind sensor which will significantly increase your safety and secure your new shading against rapidly changing wind conditions. Thanks to our infra-red heaters you can create a comfortable atmosphere for your guests, even in the cooler evenings and also, you will be able to use the outdoor season for a long time. Why should I choose the umbrella? What are the available sizes of your umbrellas? Can I fit it by myself? Can I clean it by myself? Can I set the motor to close my umbrella?